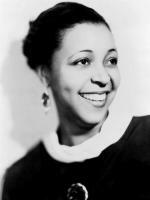 ETHEL WATERS was an African-American blues, jazz and gospel vocalist and actress. She frequently performed jazz, big band, and pop music, on the Broadway stage and in concerts, although she began her career in the 1920s singing blues. Her best-known recordings include "Dinah," "Stormy Weather," "Taking a Chance on Love," "Heat Wave," "Supper Time," "Am I Blue?" and "Cabin in the Sky," as well as her version of the spiritual "His Eye Is on the Sparrow." Waters was the second African American, after Hattie McDaniel, to be nominated for an Academy Award. She is also the first African-American woman to be nominated for an Emmy Award, in 1962. Wikipedia contributors. "Ethel Waters." Wikipedia, The Free Encyclopedia. Wikipedia, The Free Encyclopedia, 15 Jan. 2017. Web. 26 Jan. 2017. Birmingham Bertha; Am I Blue?